In an effort to give back to the aviation community and support King Air customers engaged in charitable flying, EFA (English Field Aviation) has launched a Charity Flight Exchange program, which will run until the end of 2015. During that time EFA will donate one hour of labor for each charitable flight hour flown in a customer’s King Air. The donated labor hours can be used for any King Air phase inspection completed at EFA. Customers can earn up to 25 hours per aircraft per year. The new Charity Flight program reinforces EFA’s dedication to giving back to the industry and mirrors the desire to keep processes as simple as possible for customers. “Our company motto is “We Get It,” says Travis Lamance, Co-Owner & General Manager, EFA. “Our customers already have so much to deal with in terms of regulations, from the FAA, OSHA, and the EPA. 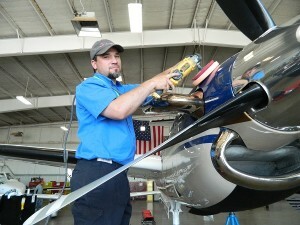 We want to make it as simple and painless as possible for our customers to maintain their aircraft.” “We carried that simplicity into this charity program in hopes that it will support King Air operators who are already engaged in charity flying or would like to be, by offsetting some of their maintenance costs,” concluded Lamance. In order to participate in the program, customers should bring official documentation of charitable flying hours performed in their King Air for any federally recognized non-profit organization when they arrive for their phase inspection. Specializing in King Air aircraft, EFA (English Field Aviation) provides professional aircraft maintenance, avionics upgrades and inspections and refurbishment services. From small inspections to complete renovation packages, EFA has the comprehensive capabilities to meet client requests and deliver concierge quality customer service. As an FAA approved Part 145 facility, EFA features fully trained and certified technicians who utilize the latest tools and practices to deliver accurate, timely and reliable aircraft service you can trust. Offering two convenient, mid-continent locations in Amarillo, TX, EFA is perfectly positioned to serve you at Rick Husband International Airport (KAMA) or Tradewind Airport (KTDW). To learn more visit www.efa.aero or call 1-806-322-1971.